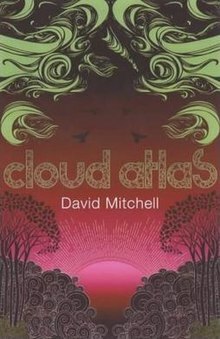 Cloud Atlas is the third novel by British author David Mitchell. Published in 2004, it consists of six different "nested" stories across time and space that take the reader from the remote South Pacific in the nineteenth century to a distant post-apocalyptic future. Cloud Atlas won the British Book Awards Literary Fiction award and the Richard & Judy "Book of the Year" award. The year it was published, it was short-listed for the Booker Prize, Nebula Award for Best Novel, and Arthur C. Clarke Award, among other awards. A film adaptation of the same name directed by the Wachowskis and Tom Tykwer and featuring an ensemble cast was released in 2012. The book consists of six nested stories, whereof each is read (or observed) by a main character of the next. The first five stories are each interrupted at a pivotal moment. After the sixth story, the other five stories are closed, in reverse chronological order, and each ends with the main character reading or observing the chronologically previous work in the chain. Each story contains a document, movie, or tradition that appears in a previous story. The first story begins in the Chatham Islands in the mid-nineteenth century where Adam Ewing, a guileless American notary from San Francisco during the California Gold Rush, awaits repairs to his ship. Ewing witnesses a Moriori slave being flogged by a Maori overseer. During the punishment, the victim, Autua, sees pity in the eyes of Adam Ewing and smiles. Later, Ewing ascends a high hill called Conical Tor and stumbles into its crater, where he finds himself surrounded by faces carved into trees. Reasoning that those who carved the faces must have had egress from the crater, he escapes. As the ship gets underway, Dr. Goose, Ewing's only friend aboard the ship, examines the injuries sustained on the volcano and Ewing also mentions his chronic ailment. The doctor diagnoses it as a fatal parasite and recommends a course of treatment. Meanwhile, Autua has stowed away in Ewing's cabin; and Ewing breaks this news to the Captain, to whom Autua proves himself a first class seaman, whereupon the Captain puts him to work for his passage to Hawaii. The next story is set in Zedelghem, near Bruges, Belgium, in 1931. It is told in the form of letters from Robert Frobisher, a recently disowned and penniless bisexual young English musician, to his lover Rufus Sixsmith, after Frobisher journeys to Zedelghem to become an amanuensis to the reclusive once-great composer Vyvyan Ayrs, who is dying of syphilis and nearly blind. Soon, Frobisher produces Der Todtenvogel ("The Death Bird") from a basic melody that Ayrs gives him. It is performed nightly in Kraków, and Ayrs is much praised. Frobisher takes pride in this and has begun composing his own music again. Frobisher and Ayrs' wife Jocasta become lovers, but her daughter Eva remains suspicious of him. Frobisher sells rare books from Ayrs' collection to a fence. Frobisher is intrigued by reading the first half of The Pacific Journal of Adam Ewing, and asks Sixsmith if he can obtain the second half of the book to find out how it ends. Once, Ayrs has Frobisher write a song inspired by a dream of a "nightmarish cafe", deep underground, wherein "the waitresses all had the same face", and ate soap. As the summer comes to an end, Jocasta thanks Frobisher for "giving Vyvyan his music back", and Frobisher agrees to stay until next summer. The third story is written in the style of a mystery/thriller novel, set in the fictional city of Buenas Yerbas, California, in 1975, with Luisa Rey, a young journalist. She meets Rufus Sixsmith in a stalled elevator, and she tells him about her late father, one of the few incorruptible policemen in the city, who became a famous war correspondent. Later, when Sixsmith tells Luisa his concern that the Seaboard HYDRA nuclear power plant is not safe, he is found dead of apparent suicide. Luisa believes that the businessmen in charge of the plant are assassinating potential whistle-blowers. From Sixsmith's hotel room, Luisa acquires some of Frobisher's letters. Another plant employee gives her a copy of Sixsmith's report, and then the plane he is on explodes. Before Luisa can report her findings on the nuclear power plant or the murders, a Seaboard-hired assassin who has been following her forces her car — along with Sixsmith's incriminating report — off a bridge. The fourth story is comic in tone, jarring after the previous story, and is set in Britain in the present day, wherein Timothy Cavendish, a 65-year-old vanity press publisher, flees the brothers of his gangster client, whose book is experiencing high sales after the murder of a book critic. They threaten violence if monetary demands are not met. Timothy's own brother, exasperated by his frequent previous pleas for financial aid, books him into a menacing nursing home. Timothy signs custody papers thinking that he is registering into a hotel, where he can stay until his personal and financial problems can be solved. Learning the truth that he is here indefinitely without the ability to leave or communicate with anyone, and subject to the staff's complete control, he attempts flight but is stopped by a security guard and confined. Timothy briefly mentions reading a manuscript entitled Half-Lives: The First Luisa Rey Mystery, but is not initially impressed by the prospective author's manuscript and only coming to appreciate later. Timothy settles into his new surroundings, while still trying to plot a way out. One day, he is struck by a stroke, just as the chapter ends. The fifth story is set in Nea So Copros, a dystopian futuristic state in Korea, derived from corporate culture. It is told in the form of an interview between Sonmi~451 and an "archivist" recording her story after her arrest and trial. Several small spelling and grammatical changes are made, to represent the change in language. Sonmi~451 is a fabricant waitress at a fast-food restaurant called Papa Song's. Clones grown in vats are revealed to be the predominant source of cheap labor. The "pureblood" (natural-born) society retards the fabricants' consciousness by chemical manipulation, using a food she refers to as "Soap". After twelve years as slaves, fabricants are promised retirement to a fabricant community in Honolulu. In her own narration, Sonmi encounters members of a university faculty and students, who take her from the restaurant for study and assist her to become self-aware, or "ascended"; she describes watching The Ghastly Ordeal of Timothy Cavendish as a pre-Skirmishes film (wherein the "Skirmishes" are a major global disaster or war that destroyed most of the world except Nea So Copros (East Asia), which foreshadows "The Fall" in the subsequent chapter "Sloosha's Crossin", in which Nea So Copros, and most of humanity's technological ability, have ended in disaster; the destroyed areas are identified as "deadlands" full of disease, ruins, and radioactive contamination). During the scene when Cavendish suffers his stroke, a student interrupts to tell Sonmi and her rescuer Hae-Joo Im that Professor Mephi, Hae-Joo's professor, has been arrested, and that policy enforcers have orders to interrogate Hae-Joo and kill Sonmi on sight. The sixth story occupies the central position in the novel and is the only one not interrupted, wherein Zachry, an old man, tells a story from his youth, speaking an imagined future English dialect. It is gradually revealed that he lived in a post-apocalyptic society on the Big Island of Hawaii. His people, called the valley folk, are peaceful farmers but are often raided by the Kona tribe, who are cannibalistic slavers. Zachry is plagued by moral doubts stemming from his wrongly blaming himself for his father's death years ago. Zachry's people worship a goddess called Sonmi and recall a 'Fall' in which the civilized peoples of Earth — known as the 'Old Uns' — were destroyed, and left the survivors to primitivism. Big Island is occasionally visited and studied by a technologically sophisticated people known as the Prescients, whereof a woman called Meronym, who has come to learn their ways, is assigned to live with Zachry's family. Zachry becomes suspicious of her, believing that her people are gaining trust before doing harm, and sneaks into her room, where he finds an 'orison': an egg-shaped device for recording and holographic videoconferencing. Later, Zachry's sister Catkin is poisoned by a scorpion fish, and he persuades Meronym to break her people's rules and give him medicine. When Meronym later requests a guide to the top of Mauna Kea volcano, Zachry reluctantly guides her there to the ruins of the Mauna Kea Observatories. Here, Meronym explains the orison and reveals Sonmi's history (introduced in the prior chapter). Upon their return, they go with most of the valley-folk to trade at Honokaa; but Zachry's people are attacked and imprisoned by the Kona who are conquering the territory. Zachry and Meronym eventually escape, and she offers to let Zachry come with them, but he tells her he cannot leave. Wounded, he is taken to a safer island. The story ends with Zachry's child recalling that his father told many unbelievable tales; whereas this one may be true because he has inherited Zachry's copy of Sonmi's orison, which he often watches, even though he does not understand her language. Hae-Joo Im reveals that he and Mephi are members of an antigovernment rebel movement called Union. He then guides Sonmi in disguise to a ship, where she witnesses retired fabricants butchered and recycled into soap, the fabricant food source. The rebels plan to raise all fabricants to self-awareness and thus disrupt the workforce that keeps the corporate government in power. They want her to write a series of abolitionist Declarations calling for rebellion. She does, knitting in the themes of greed and oppression first brought up in the diary of Adam Ewing, and this final tale agrees with Ewing's ideas that if greed and corruption are allowed to take over, with the selfish overwhelming the weak successively, it will bring down all. She is then arrested in an elaborately filmed government raid and finds herself telling her tale to the archivist. Sonmi believes that everything that happened to her was instigated by the government to encourage the fear and hatred of fabricants by purebloods. She thinks that Union is run by the government to attract malcontents so that they can be watched and controlled. However, even knowing that she will be executed, she feels that her show trial and well publicized Declarations will be inspirational nonetheless to those who will one day change things. Her last wish before her death is to finish watching Cavendish's story, which she is presumed to do. Having mostly recovered from his mild stroke, Cavendish meets a small group of residents also anxious to escape the nursing home: Ernie, Veronica, and the extremely senile Mr. Meeks. He assists their conspiracy to trick Johns Hotchkiss, a fellow patient's grown son, into leaving his car vulnerable to theft. They seize the car and escape, stopping at a bar to celebrate their freedom. They are nearly recaptured by Hotchkiss and the staff but are rescued when Mr. Meeks exhorts the local drinkers to come to their aid. It is thereafter revealed that Cavendish's secretary Mrs. Latham blackmailed the gangsters with a video-record of their attack upon his office, allowing him to return to his former life in safety. Subsequently, Cavendish obtains the second half of Luisa Rey's story intending to publish it, and he considers having his own recent adventures turned into a film script. Rey escapes from her sinking car but loses the report. When her newspaper is bought by a subsidiary of Seaboard, she is fired, and Luisa believes that they no longer see her as a threat. She orders a copy of Robert Frobisher's obscure Cloud Atlas Sextet which she has read about in his letters and is astonished to find that she recognizes it, even though it is a very rare piece. However, Smoke the assassin still pursues her and booby traps a copy of Rufus Sixsmith's report about the power plant. Joe Napier, a security man who knew her father, comes to her rescue, and Smoke and Napier kill each other in a gun fight. Later, Rey exposes the corrupt corporate leaders to the public. At the end of the story, she receives a package from Sixsmith's niece, which contains the remaining eight letters from Robert Frobisher to Rufus Sixsmith. Frobisher continues to pursue his work with Ayrs while developing his own Cloud Atlas Sextet. He finds himself falling in love with Eva, after she confesses a crush on him, though he is still having an affair with her mother. Jocasta suspects this and threatens to destroy his life if he so much as looks at her daughter. Ayrs also becomes more bold with his plagiarism of Frobisher, now demanding he compose full passages, which Ayrs intends to take credit for. Ayrs also informs him that if he leaves, Ayrs will have him blacklisted claiming he raped Jocasta. In despair, Frobisher leaves anyway, but finds a hotel nearby working to finish his Sextet and hoping to be reunited with Eva. He convinces himself that they are being kept apart from her parents, but when he finally manages to talk to her he realizes that the man she was talking about being in love with was her Swiss fiancé. Mentally and physically ill Frobisher ultimately decides, with his magnum opus finished and his life now empty of meaning, to kill himself. Before committing suicide in a bathtub, he writes one last letter to Sixsmith and includes his Sextet and The Pacific Journal of Adam Ewing. Ewing visits the island of Raiatea, where he observes missionaries oppressing the indigenous peoples. On the ship, he falls further ill and realizes at the last minute that Dr. Goose is poisoning him to steal his possessions. He is rescued by Autua and resolves to join the abolitionist movement. In conclusion (of his own journal and of the book), Ewing writes that history is governed by the results of vicious and virtuous acts precipitated by belief: wherefore "a purely predatory world shall consume itself" and "The devil take the hindmost until the foremost is the hindmost", and imagines his father-in-law's response to his becoming an abolitionist, as a warning that Adam's life would amount to one drop in a limitless ocean; whereas Ewing's proposed reply is: "Yet what is any ocean but a multitude of drops?" Cloud Atlas had positive reviews from most critics, who felt that it managed to successfully interweave its six stories. The BBC's Keily Oakes said that although the structure of the book could be challenging for readers, "David Mitchell has taken six wildly different stories ... and melded them into one fantastic and complex work." Kirkus Reviews called the book "sheer storytelling brilliance." Laura Miller of The New York Times compared it to the "perfect crossword puzzle," in that it was challenging to read but still fun. The Observer's Hephzibah Anderson called the novel "exhilarating" and commented positively on the links between all six stories. Author and Booker Prize winner A. S. Byatt in a review for The Guardian wrote that it gives "a complete narrative pleasure that is rare." The Washington Post's Jeff Turrentine called it a "highly satisfying, and unusually thoughtful, addition to the expanding 'puzzle book' genre." In its "Books Briefly Noted" section, The New Yorker called the novel "virtuosic." Marxist literary critic Fredric Jameson viewed the novel as a new, science fiction-inflected variation on the historical novel now "defined by its relation to future fully as much as to past." Richard Murphy says in the Review of Contemporary Fiction that Mitchell has taken core values from his previous novels and built upon them. Criticism focused on the book's failure to meet its lofty goals. F&SF reviewer Robert K. J. Killheffer praised Mitchell's "talent and inventiveness and willingness to adopt any mode or voice that furthers his ends," but noted that "for all its pleasures, Cloud Atlas falls short of revolutionary." The Daily Telegraph gave the novel a mixed review, focusing on its clashing themes, with Theo Tait noting: "In short, Cloud Atlas spends half its time wanting to be The Simpsons and the other half the Bible." In an interview, Mitchell stated that the title was inspired by the piece of music of the same name by the Japanese composer Toshi Ichiyanagi: "I bought the CD just because of that track's beautiful title." Mitchell's previous novel, number9dream, had also been inspired by a piece of music by John Lennon; Mitchell has said this fact "pleases me ... though I couldn’t duplicate the pattern indefinitely." The book's style was inspired by Italo Calvino's If on a winter's night a traveler, which contains several incomplete, interrupted narratives. Mitchell's innovation was to add a 'mirror' in the centre of his book so that each story could be brought to a conclusion. Mitchell said that Vyvyan Ayrs and Robert Frobisher were inspired by English composer Frederick Delius and his amanuensis Eric Fenby. An academic Martin Paul Eve noticed significant differences in the American and British editions of the book while writing a paper on the book. He noted "an astonishing degree" of variance and that "one of the chapters was almost entirely rewritten". According to Mitchell, who authorized both editions, the differences emerged because the editor assigned to the book at its US publisher left their job, leaving the US version un-edited for a considerable period. Meanwhile Mitchell and his editor and copy editor in the UK continued to make changes to the manuscript. However, those changes were not passed on to the US publisher, and similarly, when a new editor was assigned to the book at the US publisher and made his own changes, Mitchell did not ask for those to be applied to the British edition, which was very close to being sent to press. Mitchell said: "Due to my inexperience at that stage in my three-book ‘career’, it hadn't occurred to me that having two versions of the same novel appearing on either side of the Atlantic raises thorny questions over which is definitive, so I didn't go to the trouble of making sure that the American changes were applied to the British version (which was entering production by that point probably) and vice versa". The novel was adapted to film by directors Tom Tykwer and the Wachowskis. With an ensemble cast to cover the multiple storylines, production began in September 2011 at Studio Babelsberg in Germany. The film was released in North America on 26 October 2012. In October 2012, Mitchell wrote an article in The Wall Street Journal called "Translating 'Cloud Atlas' Into the Language of Film" in which he describes the work of the adapters as being like translating a work into another language. ^ Thus prefiguring the Sonmi fabricants, whose restaurant is underground and whose only food is called "Soap". ^ A future version of the proposed Greater East Asia Co-Prosperity Sphere with the Juche as the highest power. ^ Papa Song's appears to be a future McDonald's: mention is made of Golden Arches and a red/yellow color scheme. ^ Oakes, Keily (17 October 2004). "Review: Cloud Atlas". BBC. Retrieved 2 August 2012. ^ "Cloud Atlas Review". Kirkus Reviews. 15 May 2004. Retrieved 2 August 2012. ^ Miller, Laura (14 September 2004). "Cloud Atlas Review". The New York Times. Retrieved 2 August 2012. ^ Anderson, Hephzibah (28 February 2004). "Observer Review: Cloud Atlas by David Mitchell". The Observer. Retrieved 2 August 2012. ^ Byatt, A. S. (28 February 2004). "Review: Cloud Atlas by David Mitchell". The Guardian. Retrieved 2 August 2012. ^ Turrentine, Jeff (22 August 2004). "Fantastic Voyage". The Washington Post. Retrieved 2 August 2012. ^ "Cloud Atlas". The New Yorker. 23 August 2004. Retrieved 2 August 2012. ^ Fredric Jameson, The Antinomies of Realism, London and New York: Verso, 2013, p. 305. ^ Murphy, Richard (2004). "David Mitchell. Cloud Atlas". The Review of Contemporary Fiction. ^ Tait, Theo (1 March 2004). "From Victorian travelogue to airport thriller". The Daily Telegraph. Retrieved 2 August 2012. ^ "Bookclub". BBC Radio 4. June 2007. Retrieved 19 April 2008. ^ "Paris Review - The Art of Fiction No. 204, David Mitchell". ^ Mullan, John (12 June 2010). "Guardian book club: Cloud Atlas by David Mitchell". The Guardian. London. Retrieved 6 August 2010. ^ a b Turrentine, Jeff (22 August 2004). "Washington Post". The Washington Post. Retrieved 19 April 2008. ^ Eve, Martin Paul (10 August 2016). ""You have to keep track of your changes": The Version Variants and Publishing History of David Mitchell's Cloud Atlas". Open Library of Humanities. 2 (2). doi:10.16995/olh.82. ISSN 2056-6700. ^ Alison Flood (10 August 2016). "Cloud Atlas 'astonishingly different' in US and UK editions, study finds". The Guardian. ^ Mitchell, David (19 October 2012). "Translating 'Cloud Atlas' Into the Language of Film". The Wall Street Journal. Retrieved 19 October 2012.